Google Lists: More Data Collection From Maps Or Move Toward A Social Network? : All Tech Considered A new feature allows users to create lists of places and share them with friends. Is Google Maps trying to become a social network or to collect more information about its users? Maybe both. 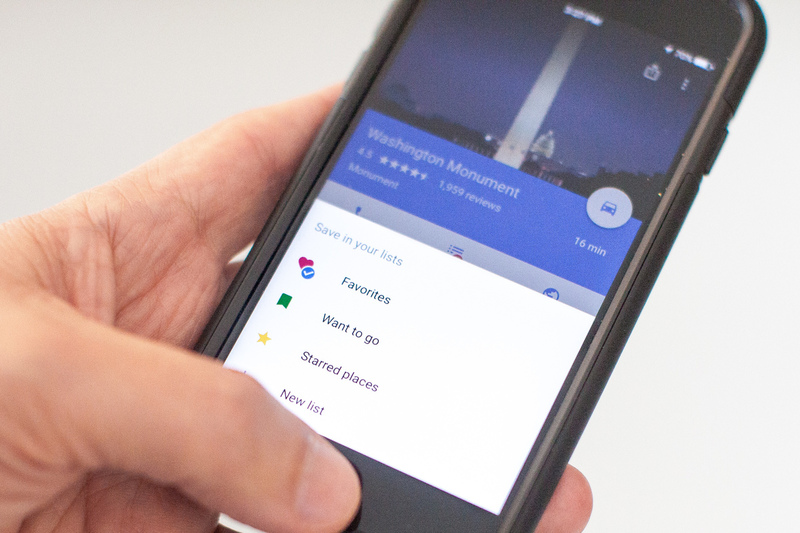 Google Maps is rolling out a new feature to create lists of locations and share them with friends. The burger place downtown? Check. The Ethiopian restaurant we visited that one time? Check. The sports bar near school we've been meaning to try? Maybe tonight is the night. To help users keep track of points of interest, Google Maps is rolling out a new feature — for both Android and iOS devices — to create lists of locations and share them with friends. Google says that it added lists because it was one of the most requested features from users. But what the company tells advertisers could be a completely different story, says Marc Rotenberg, who runs the Electronic Privacy Information Center, an independent research center based in Washington, D.C.
Google says the option will give users an easy way, say, to share favorite restaurants with their foodie friends, or to plan a tour of a new city. "Previously, people could 'star' places on Google Maps, but there was no way to organize that information or share those places with people," Google spokeswoman Elizabeth Davidoff wrote in an email. But as is often the case, the trade-off to convenience is increased data collection. "It's simply another way to collect information about users' preferences and interests," Rotenberg says. Information about where people went or where they want to go may be really valuable to advertisers, which could use it to target customers more effectively. Rotenberg games out one scenario: An imaginary Google Maps user makes a list of sushi restaurants she would like to try in Tokyo. "Now, Google could go to other restaurants in Tokyo — the competitors of the ones [the user] selected — and make them aware that this person is interested in going to Tokyo and eat sushi," he says. Rotenberg says, there is nothing the user can do about it, and privacy policies tend to state what companies will not do with data, rather than what they will do. But Google's Davidoff says, "At this time, the lists users create are not used for advertising purposes." Asked how the company planned to use the personal information shared on the lists, Davidoff told NPR that users' lists will primarily be used to enhance their own experiences in Maps and other Google products — for example, displaying the places prominently on the map or providing more relevant suggested searches. "After sharing, if a user makes their list private, everyone who previously had access will lose access to the list," she said. Google is banking a fair amount on users sharing the lists links with users, which makes us want to echo a thought by The Verge: "Is Google Maps trying to become a social network?" NPR posed that question to Davidoff. "We're dedicated to making sure lists work in all environments where our users are," she replied, elaborating that the links are shareable through texts, Facebook, Twitter and Facebook's Whatsapp messaging app. "Google Maps is a place where all users can get and share information about places regardless of where they're having their digital conversations," she said. Lucia Maffei is an NPR Business Desk intern.